RRD on a rose. Notice the “witches broom” type growth. 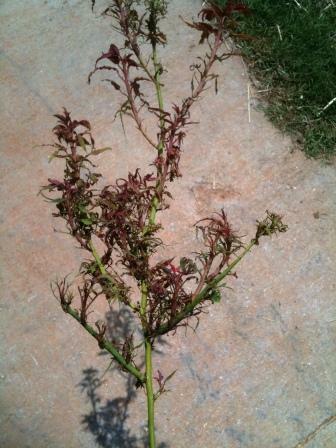 If you’ve been on some of the rose forums, attended rose talks or even just talked roses with friends on Facebook; you’ve likely heard the term Rose Rosette Disease or RRD. While it’s been around a while, I’ve noticed it’s starting to show up on the radar screen of more and more general gardeners. So I thought it’s time we talked about it. First what is it? It is a disease that is carried by a very specific spider mite, ‘Phyllocoptes fructiphilus’. An infected mite drifts on the wind, comes into your garden, lands on your roses and then injects the disease into the rose when it starts to feed. Or a non-infected mite can land on a rose that already has it, pick up and then when the wind blows it to another rose it infects that one. You know you’ve got it when your roses start to throw off strange growth that is purplish in color and most noticeably has “foliage” in the shape of what is called “witches broom” See the photos above. It actually looks a lot like roundup damage. It is particularly lethal to the species rose R. multiflora and in fact has been mentioned as a potential biological control method for it. R. multiflora spreads like crazy and in much of the eastern United States it’s classified as a noxious weed. Some government officials in their attempt to control it actually facilitated the spread off RRD by purposely infecting stands of multiflora. They claim there was no scientific proof RRD infected ornamental roses – the kind you and I grow in our garden. than others. And that is enough about how it got here. Since this is a how to blog we now want to answer the question. What the heck can you do about it! First off let’s talk about what you can do to reduce the likelihood of it getting into your garden. Since it hits R. multiflora quickly, check in your area for stands of it. R. multiflora only blooms in spring with smaller white flowers that have 5 or so petals each. That’s the easiest time to spot it. When it’s not in bloom the foliage helps. It’s a shiny green and the leaves are elongated. And it’s usually thornless and that really helps. It’s a rambler and so throws off long canes. Dig it up and get rid of it. That’s your first step. If it does happen to infect a rose in your garden there is no known “cure”. However I’ve noticed in dealing with it there are steps I can take. The first one is understanding how it spreads in your rose. 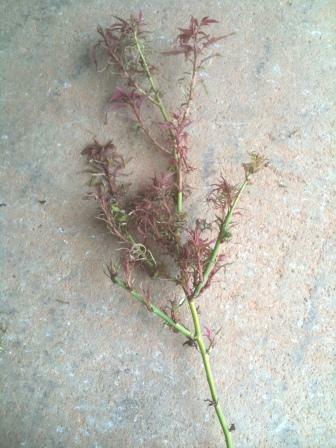 The mites land on the top of a rose cane where the new tender foliage is. They inject RRD into that part of the rose and from there it slowly travels down through the cane to the base and then up the other canes. The important word here is slowly. I’ve noticed the symptoms on the infected cane (the witches broom) very often show up before the rest of the plant is infected. So what I do the minute I see the witches broom is I follow that cane to the base of the plant and cut it off at the base. Put it in a garbage bag and get rid of it so you don’t accidentally shake any mites off on to another rose. More often than not I’ve “cleaned” and saved a rose this way. Eventually the cut off cane is replaced by a new one and it’s as if nothing ever happened. However, if the disease appears to have started to spread into another section of the rose sadly you have no choice but to dig the entire rose up and either destroy or get rid of it via the plastic garbage bag. I’ve lost a couple and I know others who have lost more. But once they understood what was happening and how to deal with it the incidents became less. So does this mean you should simply stop growing roses? Of course not! RRD is a bummer when, and if, you first get it but by knowing how to deal with it you can reduce it to another part of normal garden maintenance. Just keep an eye out for it and act quickly. Texas A&M University also a great site on RRD including a reporting feature where you can report local instances. That’s help them track where it is. Click Here to get to it.